In the gun rights community there is some rejoicing from the outcome of the recent Presidential election but don't get too excited. We lost some of the battles and the war is just getting started. 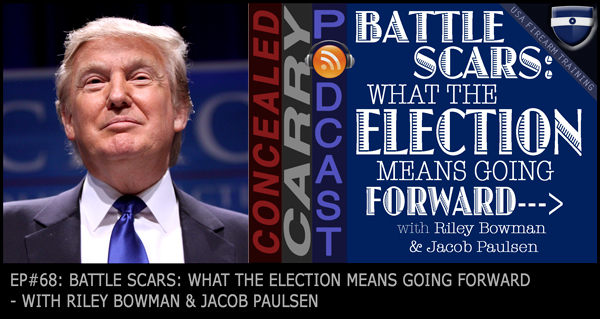 Listen in to hear what Riley and Jacob have to say about the next steps coming out of this election. slogan: What does it take to stop a bad guy with a gun — a good guy with a gun. Do you want to wait 26 minutes for the police or a good guy with a concealed carry gun that is there already???????? I totally agree with Rick. Part of the new messaging needs to emphasize that guns need to be in the hands of good guys because even the best police response times can just be too long. We love our police, but they can’t be everywhere. The other part of the messaging has to be emotional. VERY emotional. The opposing side uses emotion, not facts or logic to convince. We have largely become a society that feels instead of thinks. It’s also easier to fool someone (their tactic, not ours) than convince them that they’ve been fooled. Perhaps a campaign that features the tragedy (even graphically so) of just how quick these scenarios not only unfold, but are done. We probably could use more emotional arguments to promote the 2nd Amendment. And I think there are legitimate and logical ways (see what I did there!) to do it. I definitely think we could do a better job of appealing to people’s emotions with how many people’s lives are saved BECAUSE they had access to a gun. Most of all though, it just comes down to simple education. People are NOT educated in a general sense about guns. I wish there were more school programs where children were taught about gun safety. I wish there were more people that carried concealed. My children occasionally see my gun on my hip, and to them it’s not a big deal. In fact, it is completely normal. I LOVE THAT! More children need to have that perspective–that a gun is just a tool, that it keeps us safe, that they’re not toys, that they know how to safely handle them, and that they will not touch them unless their guardian allows them to or it is an emergency. By the way, I DO NOT think that the way to communicate our message is by encouraging open carry. I think that open carrying appeals to the average person’s emotions negatively. So we need to get our message out there, we need to educate, we need to “normalize” thoughts and feelings towards guns, but we need to do it responsibly. Thanks for everything, AJ! We know you’re one of our LOYAL LISTENERS! Guys! You don’t remember that Obama had not only a majority in the House and Senate, but 60 votes in the Senate. He should have been unstoppable. That was only six years ago. Kelly, kind of true, but only partially and only for a brief period–about 4-5 months–from September 2009 to February 2010 when Scott Brown was sworn in (who replaced Ted Kennedy). Ted Kennedy was quite ill for much of the beginning of Obama’s first year after he suffered a stroke at Obama’s inaugural luncheon. His seat was temporarily filled by Paul Kirk after he died (which was the period from Sept-Feb mentioned above). Also before that during the year, Al Franken was not seated until July since his race for the Senate was hotly contested and went through multiple recounts as he NARROWLY won in Minnesota. And Democrats only had 60 reliable votes during that Sept-Feb window because Arlen Specter switched parties and became a Democrat. It is also true that Scott Brown did not turn out to be the solid conservative that many people thought and hoped for, but let’s face it, he was a Senator from MASSACHUSETTS! But the fact is, Obama only REALLY had total control for a few months during those first 2 years. It was during that time that Obamacare was passed. And even then, it BARELY passed the House because there were even Democrats that weren’t willing to vote for it. I appreciate that you did your homework here, but I would have appreciated it more if you had admitted that you were wrong, and then filled in the details! I was responding to your saying that it had been a decade or more since the same party had the White House, the House, and the Senate. And, although as you correctly point out, Obama didn’t have the overwhelming, unstoppable advantage of 60 Senators for very long, he certainly had the advantage, more so than Mr. Trump has, and he had it for a full two years. Ahhh…I had to go back and re-listen to the episode to find what you were talking about. I was thinking, “What does Kelly mean by admitting I was wrong?” and I couldn’t figure it out. I didn’t remember saying anything about that. So I went back and listened through some of the episode again, and then found what you were referencing. Around the 6:00 minute mark of the episode, Jacob does say that it’s been a decade or more since one party controlled the White House, the Senate, and the House. I’m sure he didn’t mean that, and I didn’t notice or recall that he had said that. Please keep in mind, that although we strive to get things as right/correct as possible when recording these podcasts, that it is more difficult than it looks. We sometimes say things wrong or incorrectly or word them inconsistently. We’re talking fast, thinking fast, and it sometimes comes out wrong.